Europe’s MSG-4 geostationary weather satellite is up and running after its launch on July 15. 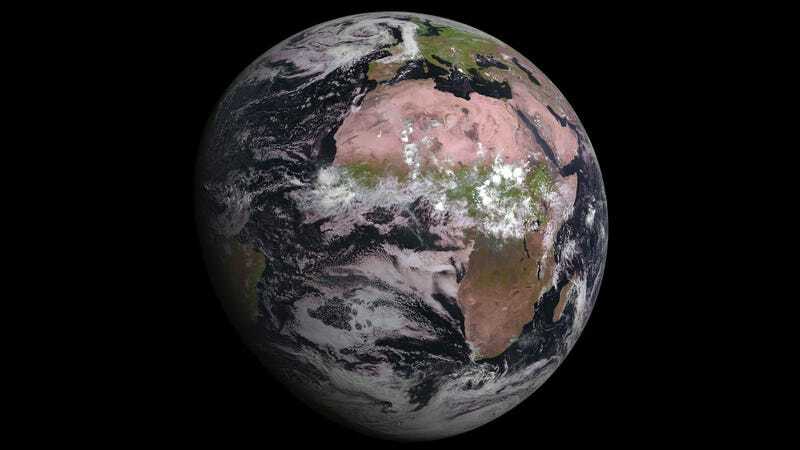 Earlier today, it’s Spinning Enhanced Visible Infrared Imager (SEVIRI) snapped its first image of Earth. And yes, we are impressed. Although you wouldn’t guess it from the exquisite photo, MSG-4 is still undergoing its initial commissioning and calibration phase. It won’t be fully operational for another six months. Once it’s ready for prime time, it will provide weather coverage over Europe and Africa every 15 minutes, along with so-called “rapid scan” shots of Europe every five minutes. Our eyes have color sensitive cells in them (called cones) that are able to distinguish red, green, and blue colors; every color you see is a combination of those three. MSG-4 has 12 color sensors on board, four of which are able to detect visible light (the kind we see), and eight others that see in the infrared. The image above is a combination of visible and infrared light. The red in the picture is actually infrared light at a wavelength of 1.6 microns (more than twice the wavelength of the reddest light you can see), green is 0.8 microns (just outside our eyes’ vision), and blue is 0.6 microns (what your eye, weirdly, would see as orange). The MSG-4 project is a collaboration between the European Space Agency and EUMETSAT (the European Organization for the Exploitation of Meteorological Satellites). You can find out more about these second generation MSG spacecraft here.